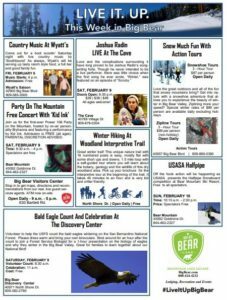 Home > Big Bear: Planning a Ski Weekend? We have had a wonderful winter of snow and the ski lifts are open. There are 3 ways up the mountain and the busiest is ‘the front way’ (Hwy 330) you may want to try Hwy 38 from Redlands or the desert way (Victorville/Lucerne Valley area).